The Cleansing Lotion is actually a foaming cleanser but it is aloe based and therefore is not as drying to the skin as other cleansers. It helps to unclog pores and removes impurities in the skin but does so without drying it out. The cleansing lotion can be used on both the face and body. A noticeably more supple skin will be seen after the first use. The Simply Hydration Moisturizer is a lightweight aloe based moisturizer that locks in moisture without leaving skin feeling greasy. It can be used on the face and body too. For best results, wait 10 minutes before applying makeup after applying moisturizer. The included headband allows you to pull your hair back so you don't get it we while cleansing your face. The loofah is for helping to exfoliate body skin while cleansing. Both are included in all the forms of the 2018 Holiday Kit. Each 2018 Holiday Kit comes with at least a Headband, Loofah and Cleansing Lotion. The variety is whether you pick out Simply Hydration, Hand & Body Lotion or Tone & Balance to round out the kit. 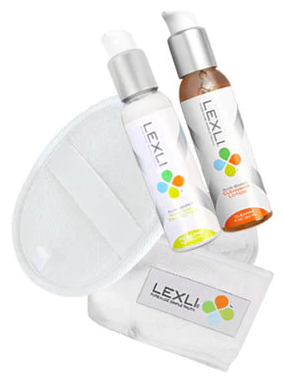 These kits are available at www.lexli.com and are $35.99. Like LEXLI on Facebook: https://www.facebook.com/LexliSkinCare; Follow LEXLI on Twitter: @lexliskincare; Follow LEXLI on Pinterest: https://www.pinterest.com/lexliskincare/ and Follow LEXLI on Instagram: https://www.instagram.com/lexliskincare/.